[ Maurice Chevalier, French entertainer. ] Autograph Signature. Place and date not given. On 5 x 12.5 cm slip of good-quality laid paper. In good condition, lightly aged. In blue ink, and simply consisting of the christian name above the underlined surname: 'Maurice Chevalier'. [ The Baron de Breteuil, as Minister of the King's Household. ] Order from King Louis XVI, in the hand of a secretary, signed 'Le Bon. de Breteüil'. 1p., folio. In fair condition, on lightly aged and worn paper. He is sending 'de nouveaux ordres du Roy pour retenir à Bicêtre le Ne. Esprit Prosper', and refers to a 'Pension de Deux cent livres qui serez payee par son pere'. [Presentation copy of offprint.] Nouvelles Recherches sur les Propriétés des Courants Électriques Discontinus, et dirigés alternativement en sens contraires, par M. A. de la Rive, Professeur de Physique a l'Academie de Geneve. 80pp., 8vo. Stitched and unbound. All but the first few leaves unopened. In fair condition, on aged and worn paper, with traces of the original blue wraps adhering at spine. 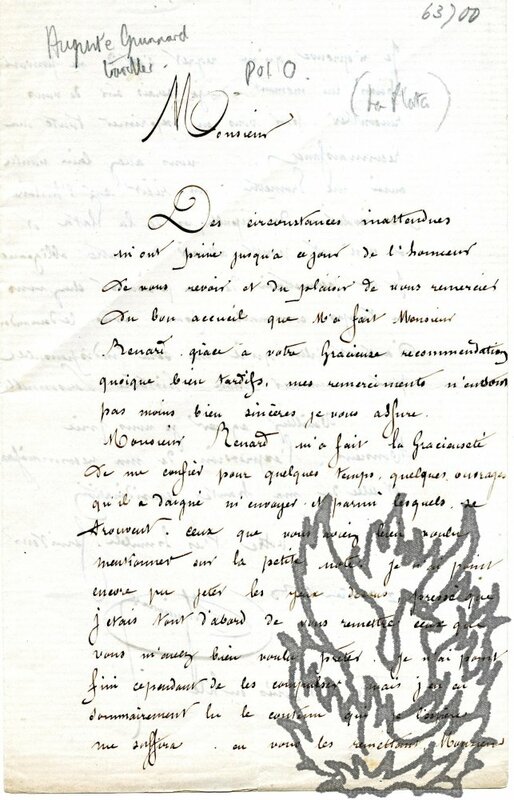 In manuscript at head of title-page: 'hommage de l'auteur'. At the time of his death de la Rive's work was deemed by one obituarist ' indispensable for the scientific student of electricity', and the phrase was repeated in the eleventh edition of the Encyclopaedia Britannica. Scarce: no copy in the Bibliothèque Nationale, and of the seven copies on OCLC WorldCat, five in Swiss libraries. 22pp., 8vo. Stitched and in brown printed wraps. In fair condition, lightly aged and worn, in chipped and damaged wraps with shelfmark. Unopened. In manuscript at head of front wrap: 'de la part des auteurs'. Scarce: no copy in the Bibliothèque Nationale, and only three copies on OCLC WorldCat. [Offprint.] Des Mouvements Vibratoires que déterminent dans les Corps, et essentiellement dans le fer, la transmission des courants électriques et leur action extérieure. Par Mr. le Professeur de la Rive. 35pp., 8vo. Stitched and unbound. All but the first few leaves unopened. In fair condition, on aged and worn paper, with traces of the original blue wraps adhering at spine. At the time of his death de la Rive's work was deemed by one obituarist ' indispensable for the scientific student of electricity', and the phrase was repeated in the eleventh edition of the Encyclopaedia Britannica. Scarce: no copy in the Bibliothèque Nationale, and of the nine copies on OCLC WorldCat, eight in Swiss libraries. Autograph Card Signed from Frederic Harrison to Elbridge H. Goss of Melrose County, Massachusetts, regarding 'the President's fine message'. With two neatly-mounted photographs of Harrison, from magazines. On letterhead of Elm Hill, Hawkhurst. 18 October 1831. The card is in fair condition, on lightly-aged paper, neatly and attractively tipped-in onto a 4to leaf which also carries a photograph of 'FREDERIC HARRISON' cut from a magazine, with both items placed within ruled borders. Laid down on a second 4to leaf, and also within a ruled border, is a second photograph of Harrison, captioned 'FREDERIC HARRISON | Author of "The Creed fo a Layman." (Apologia Pro Fide Mea).' Both photographs and mounts are in very good condition. The card is addressed to Goss at the Melrose Savings Bank, Melrose, Massachusetts. 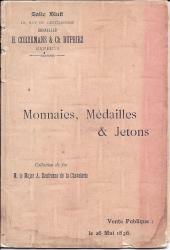 [printed Belgian numismatic auction catalogue] Catalogue des Monnaies, Médailles, Méreaux, etc. formant les Collections delaissées par feu M. le Major A. Daufresne de la Chevalerie et provenant de divers autres amateurs. Malines: Imprimerie L. & A. Godenne, Editeurs, 28, Grand' Place, 28. 1896. [To be sold 26 May 1896, 'sous la direction de H. Cordemans-de Bruyne & Ch. Dupriez, Experts, à la Salle Bluff, 10, Rue du Gentilhomme, 10, Bruxelles'. 12mo, [ii] + 28 pp. In original pink printed wraps. Card frontispiece in three panels, folding out to 18.5 x 37.5 cm., carrying facsimiles of 48 numbered coins in collotype. Text clear and complete. Fair, on lightly-aged paper, with minor damp staining at foot, in chipped and faded wraps. 893 lots, beginning with 'Monnaies Grecques et Gauloises', and ending with 'Jetons' and 'Médailles'. Excessively scarce: no copy on COPAC, and the only copy on WorldCat in the Institut National d'Histoire de l'Art, Collections Jacques Doucet, Paris. 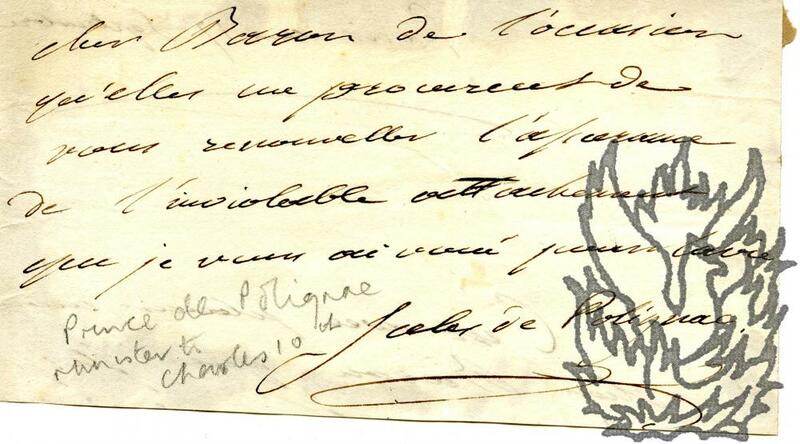 Autograph Signature ('Jules de Polignac') on part of letter to 'mon cher Baron'. Jules Auguste Armand Marie, Prince de Polignac (1780-1847), French Prime Minister under Charles X. On rectangle of paper roughly 9 x 17 cm. Cut from the head of a letter for an autograph hunter. Fair, on aged paper, with traces of previous mount on the reverse. Above the signature a florid five-line valediction in the best courtly style. Date and beginning of letter on reverse. 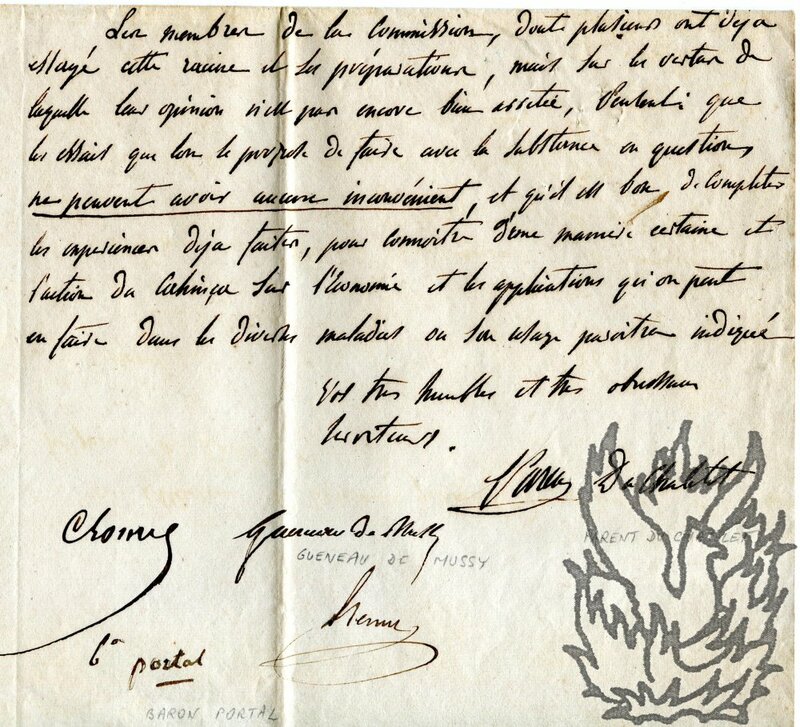 Autograph Letter Signed ('A Guinnard'), in French, to an unnamed male correspondent. 7 January 1863. 4 rue St Louis en l'Ile [Paris]. 8vo, 2 pp. Bifolium. Thirty-two lines of text. Text clear and complete. Good, on lightly-aged and creased paper. It is only now that he is able to thank him for the 'bon accueil que m'a fait Monsieur Benard grâce à votre Gracieuse recommendation'. 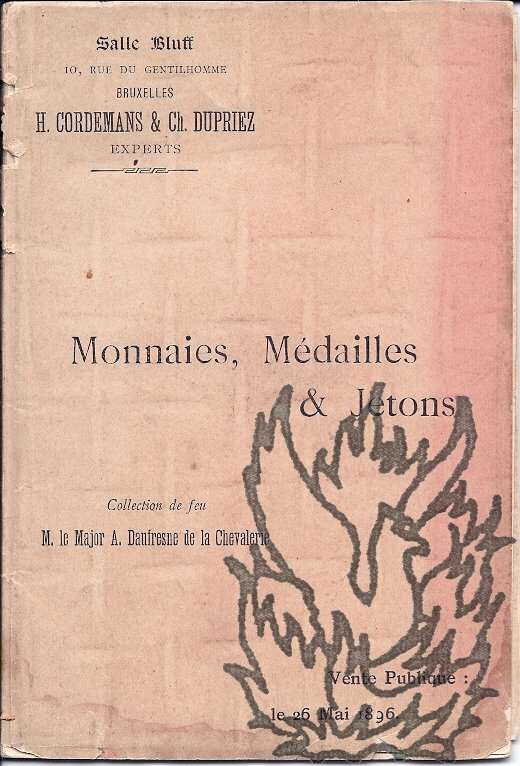 Benard has lent him 'quelques ouvrages', including 'ceux que vous aviez bien voulu <?> sur la petite note'. He has not had time to look at them, 'pressé que j'etais tout d'abord de vous remettre ceux que vous m'avez bien voulu prêter'. He has not been able to 'les compulser', but has 'sommairement lu le contenu qui je l'espere me suffira'. Autograph Letter Signed ('Ernest Havet'), in French [to someone living in Sainte-Beuve's old house]. Eugène Auguste Ernest Havet (1813-1889), French scholar. 16mo: 1 p. 14 lines of text. Close hand. He is touched that Sainte-Beuve has found time, in the midst of his labours, to write a letter expressing his 'adhésion'. 'Je suis heureux de penser, en vous écrivant rue Montparnasse [Sainte-Beuve lived at no. 11], que la philosophie et l'esprit d'indépendence ont toujours un ami dans la maison de Sainte-Beuve'. Three Autograph Letters Signed (all 'E. Beulé'), in French, to (severally) Messieurs Jalabert and Duvivier, and an unnamed woman. 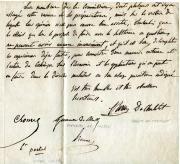 The letters to Jalabert and Duvivier without date or place; the letter to the woman dated '<?>, 16 Novembre [no year]'. All three letters 12mo. The letter to Jalabert (with a mourning border) is 2 pp, the others 1 p each. All three in good condition. The Jalabert letter (18 lines) mentions his wife and 'M. Goupil'. 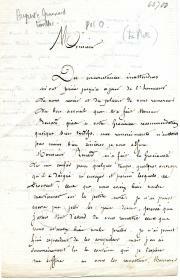 The Duvivier letter (6 lines) is a letter of introduction to a 'Monsieur Pietsch, artiste distingue de Berlin'. Asks him to give the artist 'toutes les facilités pour visiter l'Hémicycle de Delaroche et la galérie des Plâtres'. The letter to the woman (11 lines). His return has been delayed by the death of the King of Portugal. Autograph Letter Signed ('A Durand') to Smith. Saturday 29 Octr. [no year, but between 1843 and 1873]; no place [Paris?]. Two pages, 12mo. Good, on aged and creased paper. Engraving of ancient medallion as letterhead. He takes 'the opportunity of a friend going over' to send Smith 'a parcel which I have just received from Monsr De la Plane, Secretary of the Society of Antiquaries of the <?> & the Bulletin of the Society, for the Royal [sic] Society of Antiquaries, the British Archaeological Association [founded 1843], the Numismatic Society, and Smith himself. He is also sending a letter for J[ohn]. Y[onge]. Ackerman (1806-73). 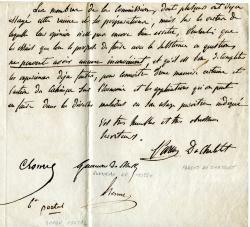 Autograph Letter Signed, in French, to Monsieur Bailly President of the Institut. 7 April 1887; 6 Rue de Phalsbourg, Paris. French architect (1845-1938), brother of the painter Jules Bastien-Lepage. One page, 12mo. Very good, on discoloured paper. Rodin (the sculptor) has informed him that the sketch requested by the committee will be ready the next Saturday. Points out that it will be difficult to convene a meeting during the Easter holidays. Signed 'Emile Bastien-Lepage'. English positivist philosopher (1831-1923). Two pages, 12mo. In poor condition: on discoloured paper with remains of stub still adhering along one edge, and with slight damage to blank verso of second leaf of bifoliate. He is obliged for the 'invitation to contribute to the pages of the International Review; & I only wish that it was in my power to accept it.' He has 'a limited amount of time for literary work' and cannot at present make 'any further engagement', but may do so in the future. Signed 'Frederic Harrison'.